As the sheep is to Christianity, the cow is to Hinduism. Lord Krishna was a cowherd, and the bull is depicted as the vehicle of Lord Shiva. Today the cow has almost become a symbol of Hinduism. India has 30 percent of the world's cattle. There are 26 distinctive breeds of cow in India. The hump, long ears, and bushy tail distinguish the Indian cow. Because the cow is respected as a sacred animal, it's allowed to roam unharmed, and they are pretty used to the traffic and the rhythm of the city. So, you can see them roaming the streets in towns and cities, grazing unmindfully on the roadside grass verges and munching away vegetables thrown out by street sellers. Stray and homeless cows are also supported by temples, especially in southern India. As opposed to the West, where the cow is widely considered as nothing better than walking hamburgers, in India, the cow is believed to be a symbol of the earth - because it gives so much yet asks nothing in return. Because of its great economic importance, it makes good sense to protect the cow. It is said Mahatma Gandhi became a vegetarian because he felt cows were ill-treated. Such is the respect for the cow, notes scholar Jeaneane Fowler in her book on Hinduism, that Indians had offered to take in millions of cows waiting for slaughter in Britain as a result of the crisis in beef production in 1996. 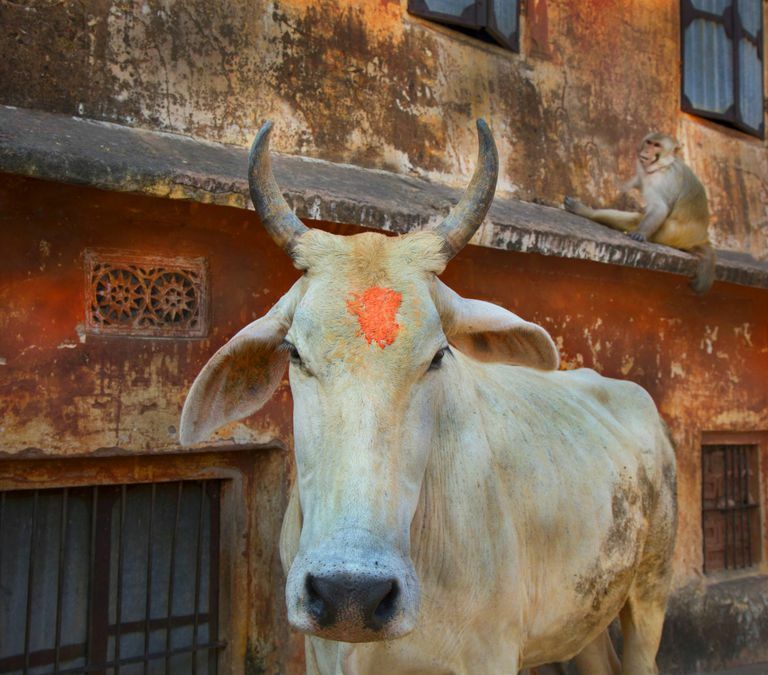 Though the cow is held sacred to the Hindus, it is not exactly worshipped as a deity by all. On the 12th day of the 12th month of the Hindu calendar, a cow ritual is performed in Jodhpur palace, in the western Indian state of Rajasthan. Nandi Bull, a vehicle of the gods, is considered the symbol of respect for all male cattle. The Nandi Bull holy site at Madurai and the Shiva temple at Mahabalipuram are the most venerated bovine shrines. Even non-Hindus are allowed to enter the 16th century Bull Temple in Bangalore. The Vishwanath Temple of Jhansi, believed to have been built in 1002, also has a large statue of the Nandi Bull. The cow was venerated as the mother goddess in the early Mediterranean civilizations. The cow became important in India, first in the Vedic period (1500 - 900 BCE), but only as a symbol of wealth. For the Vedic man cows were 'the "real life" substratum of the goods of life', writes JC Heesterman in The Encyclopedia Of Religion, vol. 5. Cows form the core of religious sacrifices, for without ghee or clarified liquid butter, which is produced from cow's milk, no sacrifice can be performed. In the Mahabharata, we have Bhishma saying: "Cows represent sacrifice. Without them, there can be no sacrifice… Cows are guileless in their behavior and from them flow sacrifices…and milk and curds and butter. Hence cows are sacred..."
Bhishma also observes that the cow acts as a surrogate mother by providing milk to human beings for the whole life. So the cow is truly the mother of the world. Of all gifts, the cow is still considered the highest in rural India. The Puranas, ancient Hindu scriptures, have it that nothing is more pious than the gift of cows. "There is no gift that produces more blessed merit." Lord Rama was given a dowry of thousands of cows and bullocks when he married Sita. Cows are also thought to be cleansers and sanctifiers. The cow dung is an efficacious disinfectant and often used as fuel in lieu of firewood. In the scriptures, we find the sage Vyasa saying that cows are the most efficacious cleansers of all. Since the cow is thought to be God's useful gift to mankind, consuming beef or veal is considered sacrilegious for Hindus. Selling beef is banned in many Indian cities, and few Hindus would be ready to even taste cattle meat, for socio-cultural reasons. Hinduism and Islam: A Comparative Study, however, says that the cow used to be slaughtered by the ancient Hindus for beef as well as sacrifice. 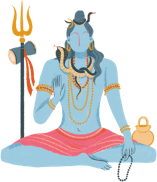 "There are clear evidences in the Rig Veda, the most sacred Hindu scripture, that the cow used to be sacrificed by Hindus for religious purposes." Gandhi in his Hindu Dharma writes about "a sentence in our Sanskrit text-book to the effect that Brahmins of old used to eat beef."